clj-pdf is a library for easily generating pdfs from Clojure. While the library elements used to build the pdf are pretty simplistic, you can still create some advanced things with a little bit of extra work. Everything in the PDF was built with code except for the dummy guy, which I recreated by hand in graphics software. 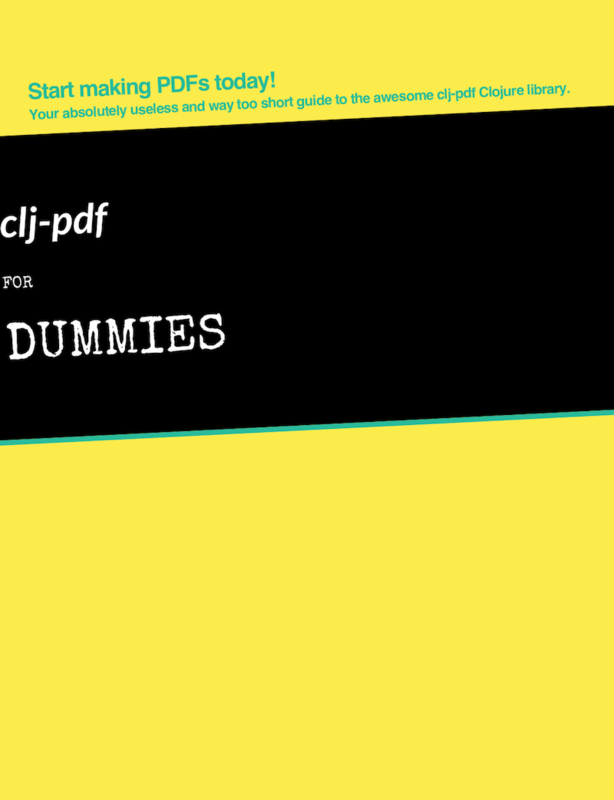 "Generates the pdf at specified location (defaults to `output/clj-pdf-for-dummies.pdf`)." [["-d" "--dest DEST" "Destination to output the pdf to." We use tools-cli to parse the arguments passed by the user when they run the project from the command line. We also set a default destination and use io/make-parents function, to create the directory structure to put our pdf in (if it doesn’t already exist). You should see the test/dir directory structure created. Next, let’s introduce clj-pdf and generate some pdfs. Above will generate a pdf with a string “Hello, this is my first pdf!” on the first (and only) pdf page. Inside the vector passed to pdf/pdf function you’ll see a map of settings for your document. I hope they are pretty much self-explanatory, but refer to clj-pdf docs for reference. Notice we’ve also added a [:pagebreak] before the first pdf page. Otherwise, the text would appear on top of our cover. "Given a hexadecimal string (starting with `#`) representing a color, returns the corresponding RGB integer." Try generating your pdf now. The first page should be all yellow. Sidenote: Unfortunately, this won’t work when running your project from a compiled .jar. If you need to generate pdfs with custom fonts this way you have two options - use system fonts or create temp directories, outside the jar and load the font from there. (str "Your absolutely useless and way too short guide to the awesome"
In above example, we’re using system fonts to write a few sentences on the cover. Like before, we set the color, then we set the font and last but not least, we draw the string using drawString method. You should get the idea by now. To position the [:graphics ... element we’ve also set :translate to [0 100] ([x y] position from top-left corner) as well a tilted it a bit by setting the :rotate key to -0.05 (degrees). Two things are missing - the cover title and the dummy guy. Let’s deal with the former. Call the cover-text function inside cover and pass the g2d object as well as page-width (you’ll see why we need it in a second). Generate the pdf and make sure everything is working as expected. We are getting pretty close! So far we’ve been only using the [:graphics] element, but there’s another way you can programmatically build graphical elements in your pdf. The [:svg] element lets you either load an svg file or render an SVG string. Since this tutorial is already getting pretty long, we’re going to do the former, but you could, for example, use a library like Hiccup to create pretty complicated things with it. And that’s pretty much it! While clj-pdf certainly has some limitations, you can build a lot of great things with it with a little bit of creativity. Hope you’ve learned something today - let me know if you have any comments and/or questions. This website was built using Gatsby and its sources code is available on Github.